I finally finished the ninth item of 2018’s Make Nine list and moved right on to the first one of 2019’s Make Nine. On the left we have an Archer button up, with the “popover” placket variation. I was so thrilled I figured out how to engineer the front placket so the plaid matched that I didn’t realize I cut it so it opens the “wrong” (man shirt) way. Oh well–still thrilled about that pattern matching. This is in a remnant from Stylemaker Fabrics, bought back in 2017. On the right, we have a Nikko top in a nice cotton/spandex from Stonemountain. I hadn’t sewn any knit tops in a while and I forgot how fast they are–this was constructed in pretty much an afternoon. January was, understandably, a hard month for doing things like sewing, or focusing, or enjoying anything, really–but it feels good to be getting back into the groove a little. Since September’s been unseasonably warm (this week it’s “only” 75, after being 90 for most of the month) I was able to get the eighth project on my Make Nine list finished while I can still wear it. I don’t look very thrilled in the modeled shot (it was the end of the day) but I’m really, really happy with how this turned out. The shirting fabric was beautiful to work with and that square shape gives off strong art teacher vibes. I had a coworker ask me if it was a Madewell shirt, so I definitely got the look I was going for. It’s a little more than halfway through the year (how?!) so I thought I’d check in on the 2018 Make Nine Plans. I’ve made good progress overall, but looking at what I actually wear, what I’ve actually made, and what I realistically have time to do in a busy second half of the year, I’m changing up the plan a little. The quilted Nani Iro jacket (I considering cutting those sleeves off and turning it into a vest, since I’m still not happy with them). The Wiksten Kimono Jacket which I love and wear a lot (when it’s not 100 degrees). Three different Adventure Tanks–I realize I only blogged the muslin so I’ll have to get some photos of the versions in bamboo jersey. A linen Willow Tank. After that post I went back and re-did that darts, so I feel a lot better about it now and love that indigo color. A muslin for the vintage jumpsuit pattern, which turned out so wearable I may call it its own project? Love this one. It’s prime short-sleeve boxy shirt season so I know I should jump on the stripy Blaire shirt (top row center) but I’m having a hard time getting motivated. My annual plaid flannel Archer can happen in October or November, so I’m not worried about that (left of the Blaire shirt). I have fabric for the long sleeve version of the jumpsuit and it would be nice to have, but I’m not going to push hard to get it done this year. I had planned to make a longer denim duster (second from left, bottom row) to copy this one, and I still think I’d like one in my closet. But copying that artist with my Nani Iro jacket made me feel small, so I don’t want to rip off another small manufacturer. I made that amazing jacquard Wiksten Kimono Jacket, so I’m saying that can fill the navy jacket slot this year. I was going to try a lengthened Archer shirt dress (bottom right) in some precious Kokka twill, but I have worn a dress exactly once this year and felt uncomfortable the whole day. So I’m scratching the dress plans–that fabric can be another jumpsuit instead. So there you have it! I never thought I would be a joiner on a social media challenge, but this has been a good way to get me to think about a “wardrobe” versus “what can I make next?!”. Also, lists. I love anything that involves lots of lists. Back when I was making underwear at the beginning of the year, I ordered some of Spoonflower’s stretch polyester without getting a swatch (you know where this is going…). Turns out it’s not stretchy enough for undies (sad trombone!) but I used it to test out the Fancy Tiger Adventure Tank pattern on my Make Nine list. I cut a straight medium; next time I will go down to a small since the body is just a hair too wide, especially in a drapey fabric. But this is a seriously great pattern–only uses a yard of fabric, goes together in under an hour, has a high neck, and covers the tops of your shoulders so they don’t get fried out in the sun. I’m wearing this poly one for running/gym times and finished another test one in bamboo jersey that I wore hiking Sunday. I am also trying to blend into this honeysuckle vine here? Is this how running and muscles work? Don’t mind me. I have a jumpsuit on my 2018 Make Nine list, a copy of this Madewell one. Before I cut into the good Kaufman twill (in that brick brown that’s sold out everywhere) I wanted to check the pattern. So I got a duvet cover at IKEA during their January sale, cut apart the front and back, and used one piece to make a wearable muslin. This was fast and easy and fit pretty well with minimal tweaks. The waist has an elastic casing as drafted; I tried it with the blousing but thought it made it look dated, so I ended up just folding the casing over on itself and topstitching it like it was an intentional waist detail. It works! When I make it in the “real” fabric I’ll have to figure out how to do a swayback adjustment, but otherwise I think this is a good fit. Jumpsuits are so comfortable, guys–you’re covered up and look fashionable but it feels like you’re not even wearing pants. Yay loose clothing! The snow day meant I could finish up my third project in the 2018 Make Nine: the Wiksten Oversized Kimono Jacket. I had some doubts about the pattern–back in 2009 I found Jenny Gordy’s blog, right when she was launching the Wiksten pattern line, and I fangirled hard. I made the Wiksten tank and the Tova top a couple times each but I just…didn’t love them. I had a hell of a time getting the tank not to gape; the tunic always flapped open and never seemed to hang right. The pattern itself is a free PDF download, but you have to buy Making magazine to get the instructions. I’ll be honest: I had the pattern downloaded and ready to go and thought, “I can wing it without $20 instructions,” but then my better nature prevailed. I got the magazine with part of a gift card to my local yarn store, and I’m glad I did: the construction makes it fully reversible, without bagging a lining. Clever! About that fully reversible: I knew I wanted the exterior to be golden tan, like the famous Elizabeth Suzann jackets (I even curved the pocket top on mine because I am a copycat). I got some Kaufman Essex linen-cotton in “Leather” from Fancy Tiger for the exterior, but it was a hair too light for the linen I’d picked up for the lining. So I switched to some IKEA heavy cotton/linen I’d had in my stash for a while. And “Swedish art teacher in Hawaii” on the inside. Well, firstly because I had a helluva time getting the sleeves to work. I blithely assumed kimono sleeves would be simple and just used the body of the StyleArc Sabel cardigan for a pattern. I ended up doing a lot of tweaking along the side seams to try to get a little more room in the sleeves. It’s definitely wearable but kind of looks like it has T-rex arms on the hanger. Secondly, I feel like I entered into too gray of an area of copying with this. I thought making it would be similar to my Madewell knockoffs, where I feel cool for replicating a look and saving money, but I wore it to work and everyone oohed and ahhed over the fabric and the giant pockets and I just felt…flat. I couldn’t take credit for the good ideas of either. Do I still love it? Yes. That fabric–Nani Iro “Beautiful Life–is what made me want to make it in the first place (I found maybe the last of the b&w canvas colorway from here). There’s moons and stars and planetary rings and TINY. COSMIC. HORSES. Maybe the next time I want to copy something so closely, I’ll just buy the fabric and let my ideas percolate a little more. I made a straight size M and ended up interfacing the inside of the collar, so it would stand up a little better. 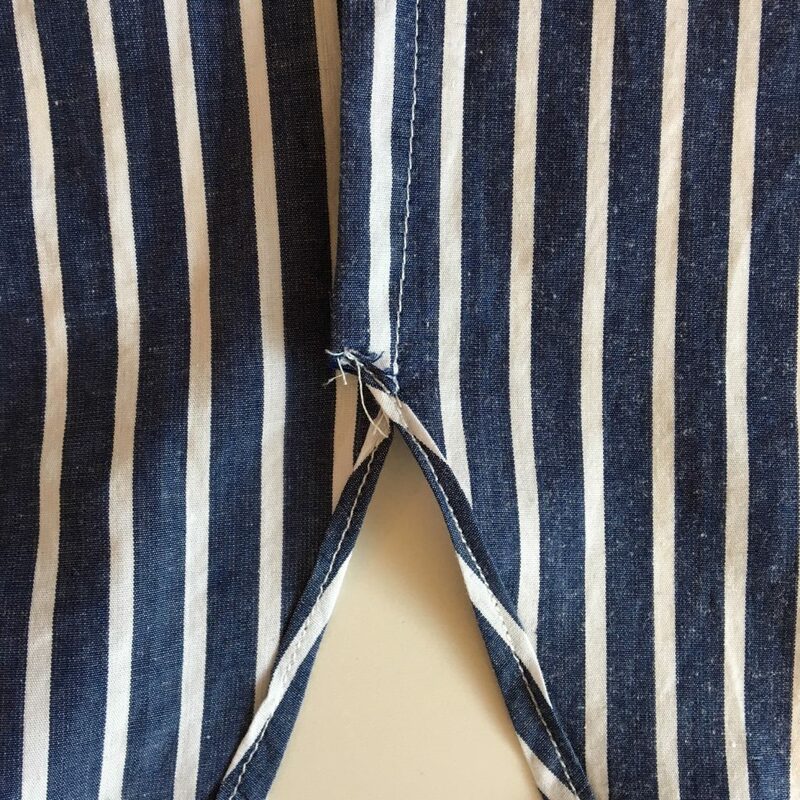 I also took off 3/8″ on the seam between the cuff and the sleeve but the length is still a little generous–and my arms are fairly long, so normal-armed people, beware. This first project on the list is a roaring success: It’s casual but not as casual as a normal sweatshirt, I made it start to finish in about four hours, and it’s warm but not hot. And it looks like Madewell but wasn’t made in a sweatshop! I’ve been seeing a “2018MakeNine” hashtag on the sewing accounts I follow on Instagram and dug into it a little more–it’s a way to plan out the top nine things you want to make for the year. I’m going to participate and spent some time thinking about what I needed/wanted most in my closet. I’ll never have a minimal wardrobe but I want to make things that are versatile, comfortable, and will really get worn. The “Summer of Basics” challenge was a turning point last year for me so hopefully this will help keep me focused. There are mostly tops in this roundup because I made five pairs of pants last year and need things they work with. And yes, there are 10 projects, not nine, because those two tanks won’t take any time at all and I desperately need summer tanks. I already have fabric for about half of these; for the rest, I’ll try to buy from indie fabric stores versus JoAnn or Fabric.com. I’m even trying to stick to a rough color palette, to really make sure these all work together. So what am I making? Here’s the Pinterest board for my plans so far; I’ll blog the projects here but if you want to see progress shots on Instagram, too, this is me.